This Brazilian Snapdragon blooms all year round and repeatedly. 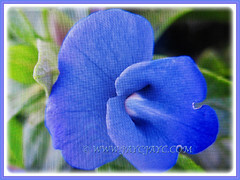 A fuss-free subshrub with uniquely shaped violet-blue to purple flowers with a distinct white eye at the base. 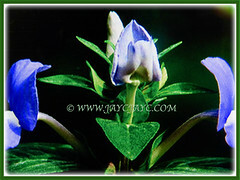 Flowers are long-lasting and popularly used as cut flowers. 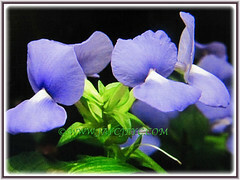 Common Names: Brazilian Snapdragon, Amazon Blue. Etymology: The genus name, Otacanthus comes from the Greek word akanqoj which means thorny ears. The specific epithet, caeruleus, is a Latin word, meaning sky-blue, referring to the colour of the flowers. Origin: Native to eastern Brazil. Plant type: An ornamental and perennial subshrub. Features: Otacanthus caeruleus is a species from the genus, Otacanthus that consists of six species of flowering plants. A compact subshrub that reaches about 1.0 – 1.2 m tall. The green, sessile and lanceolate-shaped eaves have depressed, pinnate veins and are oppositely arranged. The leaves have a minty pine fragrance. The stems are woody and brownish. The inflorescence is a terminal spike of solitary flowers with a green calyx and blue to purple, bilabiate corolla with a conspicuous white spot on the lower lip. 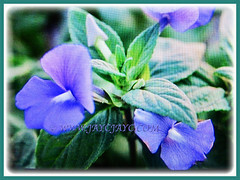 Captivating flowers, measuring about 3.5 cm long and 2.5 cm wide, have a characteristic large flat lower lip. 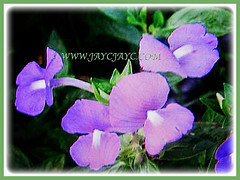 The flowers have a slender, 2.5 cm long floral tube and are bilaterally symmetrical with fan-shaped upper and lower lips. 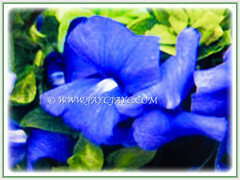 Culture (Care): Otacanthus caeruleus or Amazon Blue can be easily grown with minimum care. Soil: Humus-enriched, loamy and well-drained soils. It prefers an acidic soil. Others: Deadhead the flowers and trim off the withered/shrivelled leaves to keep it tidy and aesthetically pleasing. Plants will spring back after a hard prune. Generally free from serious diseases and pests. For non-hardy regions, grow Brazilian Snapdragon as a potted plant and bring them to overwinter indoors. Propagating from stem cuttings and grown in a greenhouse with a minimum temperature of 18°C will yield flowering plants within 3-6 months. Reduce watering during cooler temperatures, allowing soil to dry slightly between waterings. Propagation: Easily propagated from stem cuttings. Alternatively from seeds that are obtained by self-pollination will germinate within 1-2 weeks. 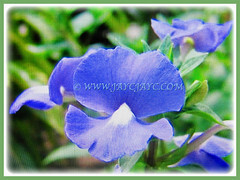 Usage: Otacanthus caeruleus or Brazilian Snapdragon are excellent in parks and public gardens, as well as in small home gardens. 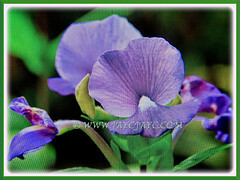 Ideal to be grown on the ground in garden borders or beds with its ornamental flowers. Suitable as a ground-cover plants. Great for container planting or above-ground planters. 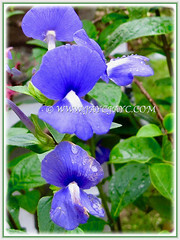 Plant them if you lust for blue-coloured and unique blossoms. 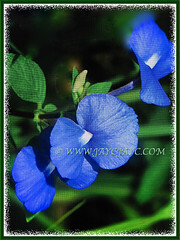 The showy flowers are long-lasting and make great cut flowers in a vase. A magnet to attract butterflies and hummingbirds.